Nothing like standing in front of an excited group of on-fire Catholics wanting to learn and grow in the truth of our Faith. To see eager eyes and ready ears inspires me. Kids love these talks too – because of the energetic style and delivery full of content and good stories. What a thrill to have so many young people come up afterwards and thank me for turning them on to a deeper understanding and a fun time. Kids in an audience are great and to see their lives effected for the better is a thrill. We have lots of talks and materials. Click the image for a complete list with categories – from Bible Study and Apologetics/Evangelization to Atheism and Islam. Biblical characters like Abraham, Moses, Mary and St. Paul are excellent vehicles for relaying the biblical and Catholic truth in an exciting way that is easy to relate to. 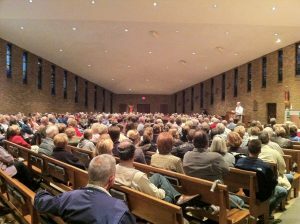 Looking for a conference speaker for an exciting parish mission? Check out Steve’s www.InviteSteve.com for more info, schedules, topics and lots of pictures and recommendations. Looking forward to your talk next Sunday afternoon at St. Irenaeus in Rochester Hills, Mi. If any blog followers out there are in the area, you are welcome! It starts at 4:00 PM Sunday. You can Email me or call for more information. tgovern@comcast.net, 248 373 4675. Steve will talk on the life of St. Paul and his massage of mercy. Next post: Holy Land Pilgrime Arrived – Ready to Go!